Have an ordinary pair of shoes that could use an update? Good news: You can turn your boring old shoes into a canvas for some fun new creative ideas! Shoes naturally provide an excellent surface onto which you can apply a variety of decorating techniques. With very little effort, you can customize your own shoes in a way that will ultimately look like you paid a fortune for them at a high end boutique. #1 – Paint your shoes. Giving your shoes a whole new look can be as simple as changing the color. Fortunately, you can completely transform the look of a plain shoe with a can of spray paint. Cover the inside soles and any other areas you don’t want painted with tape first. Then spray away! After you’ve changed the basic color of the shoe, you then can add interesting designs using fabric paint and a small sponge brush. You could also use Sharpie markers in all colors or watercolor paints to add unique designs to your shoes. With leather shoes, in order to ensure a smooth surface for painting, you might want to wipe the leather with rubbing alcohol or acetone first to remove any finish on the leather which could keep the paint from sticking. Here are some helpful tips before painting leather shoes. Here’s a step-by-step tutorial for transforming your shoes with acrylic paint. #2 – Make your own shoe clips. To quickly transform a pair of shoes and give them a dressy look, attach a pair of clip-on earrings to your shoes. You’ll get instant sparkle and elegance! Shop garage and estate sales to find interesting, vintage clip-on earrings to attach to a boring pair of pumps. These are great for parties and other dressy occasions. You could also buy shoe clip blanks online, which allow you to glue on any decorative object and clip it to your shoe. Generally speaking, shoe clips work well because they can easily be taken on and off — to go from day to evening. Here’s a step-by-step tutorial for making your own shoe clips. #3 – Bedazzle with gemstones. Choose some shiny flat back rhinestones or crystals to take a regular pair of shoes to the next level — like this. 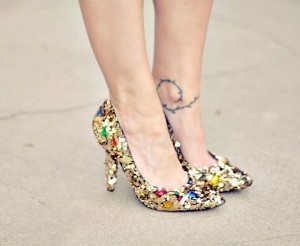 You might decide to just put the sparkly gems on the heels of your shoes, or you could cover the entire shoe with them — it’s completely up to you. Simply use a pair of tweezers and a product like E-6000 or Gem Tac to permanently attach the gems to your shoes one by one. Here’s a step-by-step tutorial for applying rhinestones/crystals to heels or wedges. #4 – Add charms or buttons. Buttons are great for adding pops of color and personal style to your shoes. 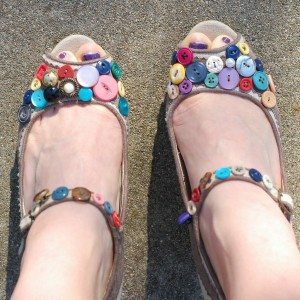 Old vintage buttons with the back shank removed can be attached to shoes to give an elegant look, as can small charms found at your local bead or craft store. To give charms a vintage look, antique them by covering them with black acrylic paint then wiping the surface with a moist cloth to remove paint from the high areas. You’ll have a lovely dark finish in the crevices which will add depth to the charm and to your shoe. Here’s a step-by-step tutorial for adding button bling to shoes. #5 – Decoupage your design. 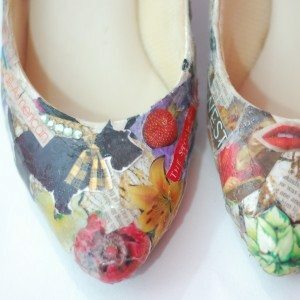 A classic look for DIY shoes is to decoupage them! Use any paper with colors that you like to make fun new designs on old shoes. All you need is mod podge (or PVA glue), a small sponge, and some water. Here’s a step-by-step tutorial to decoupage shoes. #6 – Make a statement with colorful gemstones. Visit your local craft or bead store to find cabochons. They’re stones with a flat back that can be glued to any surface. You’ll find them in a wide variety of sizes, styles, and materials — including semiprecious stones, glass, and crystals. Bring along a pair of shoes and arrange the cabochons in interesting patterns on the shoe until you find a design you like. Use a product like E-6000 or Gem Tac to permanently attach the gemstones to your shoes. Can you imagine how much you’d pay for pair of shoes decorated with gemstones in a high-end boutique? Here’s a step-by-step tutorial for applying gems to sandals. So… why settle for boring shoes when you can have custom decorated ones? With a little creativity, you can turn your feet into beautiful works of art!